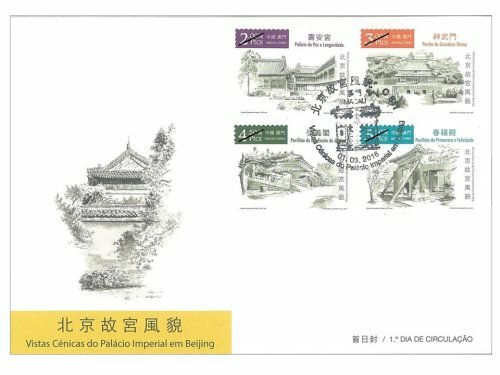 Stamp Issue "Scenery of the Imperial Palace in Beijing"
The Palace Museum is situated in the Forbidden City in Beijing, was the Chinese imperial palace through the Ming and Qing dynasties. Built 596 years ago, it is the largest surviving wooden palace complex on earth and was added to the World Cultural Heritage List in 1987. 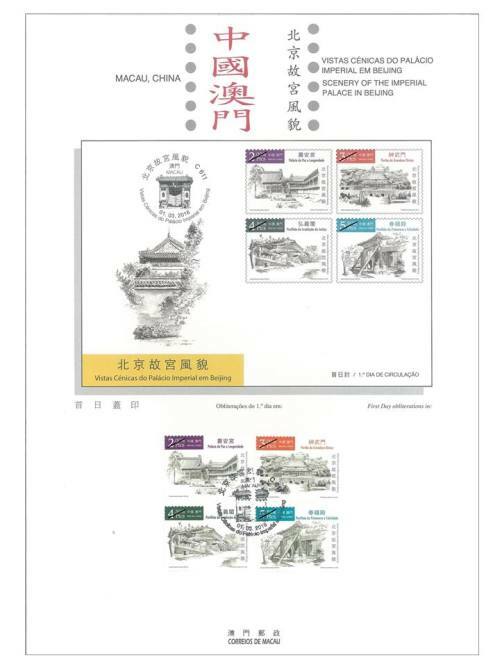 Macao Post will issue the stamp theme “Scenery of the Imperial Palace in Beijing” on 1st March, 2016, and thus, Macao has provided another opportunity for the Forbidden Palace architecture to be highlighted to the rest of the world. 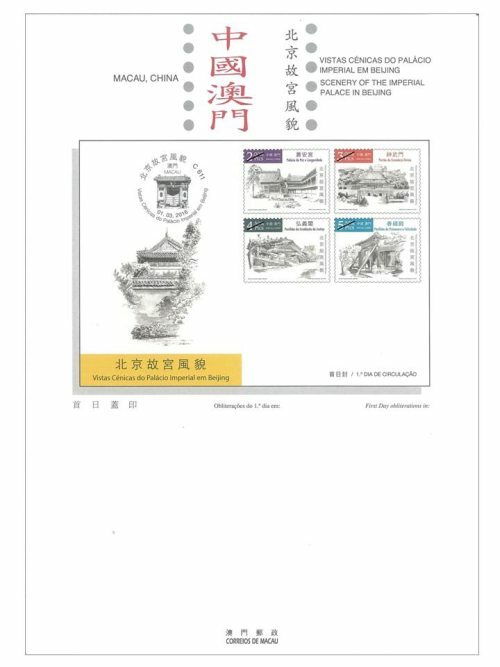 The images are selected from the French artist Charles Chauderlot, a total of 81 ink wash paintings were completed between 2002 and 2004, and the most representative painting depicting the scenery of the Palace Museum is selected for this issue. Chauderlot has used the Chinese ink wash tools and the expressive techniques of Western sketches to demonstrate the unique charm of this Chinese palace. 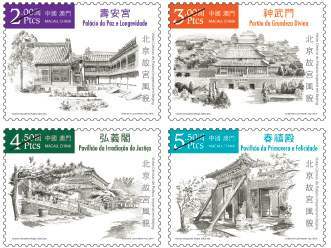 This issue includes a set of four stamps and one souvenir sheet, the images show the architectural beauty of the grand Forbidden city, which include: “Palace of Longevity and Peace”, “Gate of Divine Prowess”, “Pavilion of Spreading Righteousness”, “Hall of Spring and Happiness” and “Hall of Supreme Harmony”. 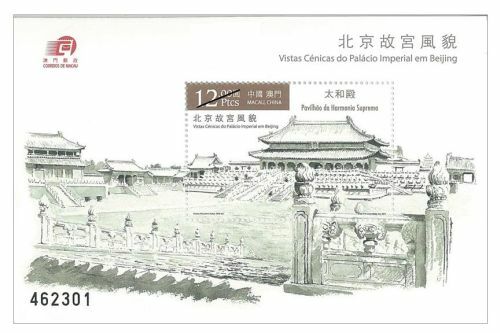 The images show on the first day cover and the postmark are “Pavilion of Imperial Library” and “Gate of Starting Auspiciousness” respectively. 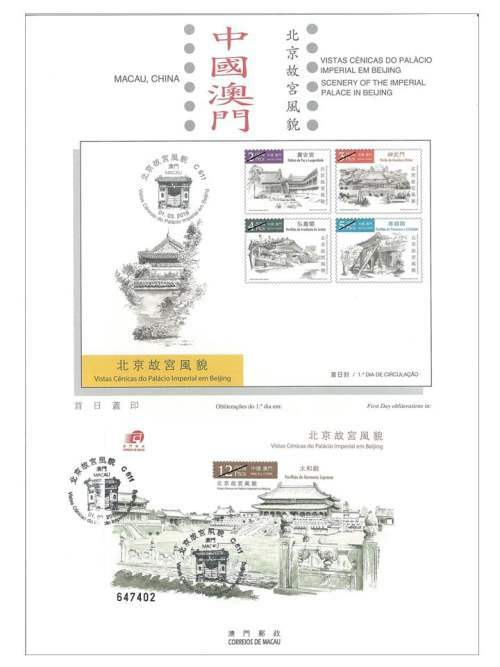 The composition of this issue is designed by Macao Post, and the text of the information brochure is written by the Director of Macao Museum of Art, Mr. Chan Hou Seng. This is the second theme in 2016. 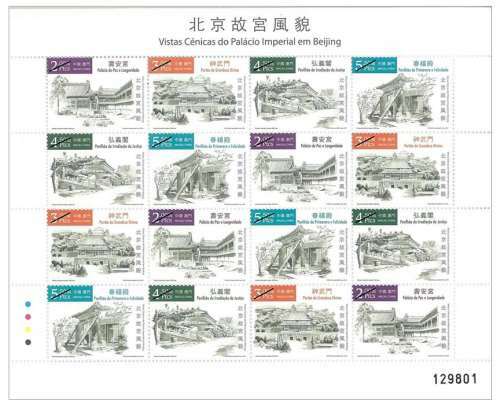 The previous issued stamp is “Lunar Year of the Monkey” on 22/01/2016. 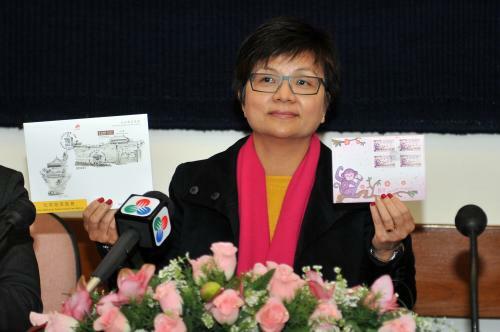 The label stamp “Lunar Year of the Monkey” to be issued on 22/02/2016. 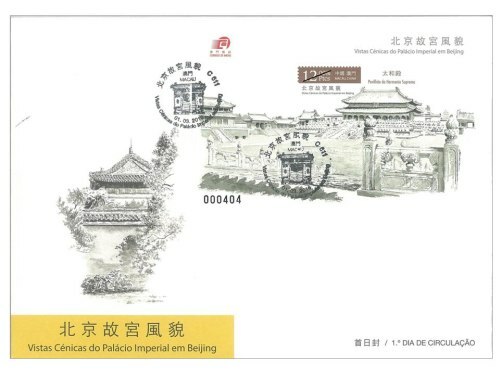 Technical Data of Stamp "SCENERY OF THE IMPERIAL PALACE IN BEIJING"